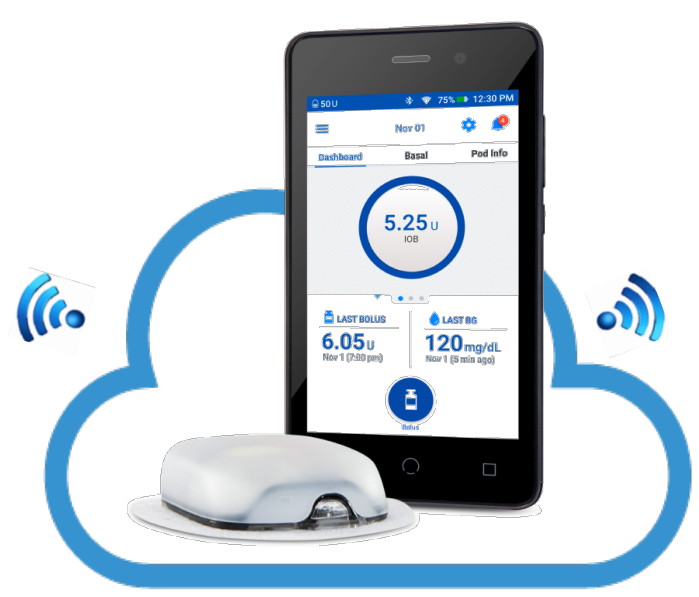 Following exciting news that Medicare will soon cover Omnipod, Insulet also announced that it has submitted the long-awaited Omnipod Dash touchscreen handheld (PDM) to the FDA. The company hopes for FDA clearance and a limited launch in the second half of this year. Insulet has not provided details on how large the limited launch will be, how much the Dash PDM will cost, or when a full launch will occur. However, since Dash will change the Omnipod to Bluetooth communication, all users will eventually migrate to it. The small tubeless pod will remain the same size. Read more details below on Dash, including the addition of pump data viewing on smartphones and remote monitoring. The Omnipod Personal Diabetes Manager (PDM) is a wireless handheld that allows Omnipod users to control the tubeless insulin pump, with functions such as taking a mealtime bolus, programming basal rates, and seeing how much insulin is “on board.” The Omnipod PDM has not been updated in years, which makes the upcoming sleek Dash system a welcome change. The new handheld Dash device is a “locked-down” Android smartphone, meaning it has the look and feel of a modern touchscreen smartphone, but is custom-designed to only run the Omnipod software (i.e., it cannot install other apps). Importantly, the Dash PDM will update the pod’s communication to Bluetooth, unlocking a new set of safety and convenience features. First, users will be able to see key pod data on their own smartphone via a new “Display” app. As shown in the picture below, the pod will talk directly to the Dash handheld, which will then relay data to a user’s own phone. This “secondary display” is a nice convenience – e.g., checking insulin-on-board won’t require pulling out the handheld. For those wondering, the pod won’t talk directly to a user’s own phone, so Dash will have to be nearby for taking a bolus. In a win for pediatrics, Dash will also launch the "View" app for caregivers, featuring remote monitoring (similar in concept to Dexcom’s Follow app). The Dash PDM will have Wi-Fi, meaning software updates can be installed remotely and data can be sent to the cloud passively. Insulet has also partnered with Ascensia to allow Dash to talk wirelessly with the Bluetooth-enabled Contour Next One meter. The wireless communication will import meter values directly onto the handheld, a convenience for calculating mealtime boluses. This also means the Abbott FreeStyle Lite meter will not be part of Dash. For Dexcom users, Dash will be similar to the current setup – CGM data will not be sent to the Omnipod handheld. However, the use of Insulet and Dexcom smartphone widgets (see above) will allow users to see their pump and CGM data side-by-side on their own smartphone lock screen. 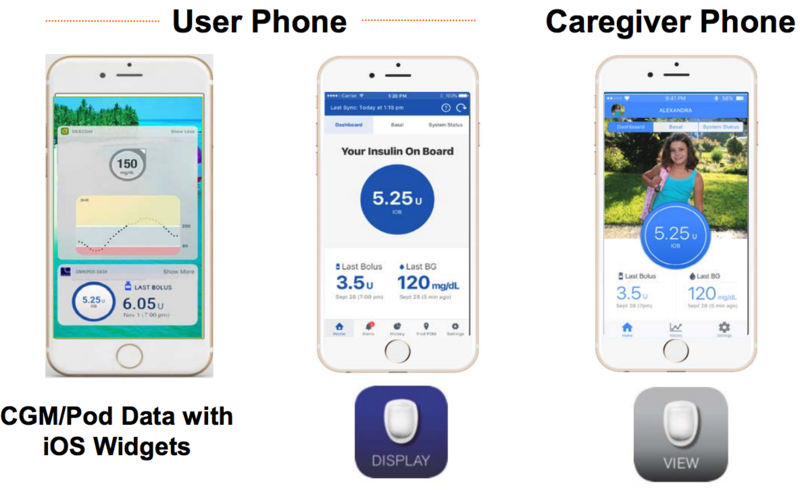 Dash is the platform for Insulet’s future products, including its products for users with higher insulin requirements (U500 and U200 Omnipods) and the Horizon Automated Glucose Control system. The latter is expected to launch in 2020. Omnipod Dash also marks the second insulin pump in the US that adds Bluetooth, following Tandem’s t:slim X2.